Let me focus on the positive - I liked the set very much - it covered for a stage set for Hamlet, a church, a country house, a police station ... and was generally very evocative of the idea of "Morse" and Oxford. I was (and I am not being ironic or sarcastic) glad to see the actors were clearly enjoying their tour. It made the audience join in the fun and also produced excellent acting - some dramatic scenes were played with particular skill and conviction. I did find that there were some very heavy handed references in the script to the setting in the 1980s - unnecessary in my opinion - I know some people did not live through the era but I am sure they could have kept up! But the fundamental flaw was that the main cast were basically to old. This is not an ageist statement but the entire plot hinged around the premise that the main characters were at college together "25 years ago" and I think either you have to cast accordingly, or write around it in the script. 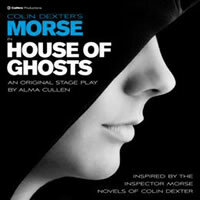 The writer did actually pen some of the Morse episodes, which meant that some of the linguistic foibles of the TV characters really jarred when repeated by different actors on stage ( I am thinking of Chief Superintendent Strange) - and in the same context there was really no particular reason to make Lewis a Geordie in this play - I think he was (as his name implies) Welsh in the original books. Rob and I loved the truly high quality TV adaptations - and this was lots of fun - well worth an evening out.